THE FIAT C.R.30: The machine illustrated is the two-seater version which won the Bibesco Cup last year. 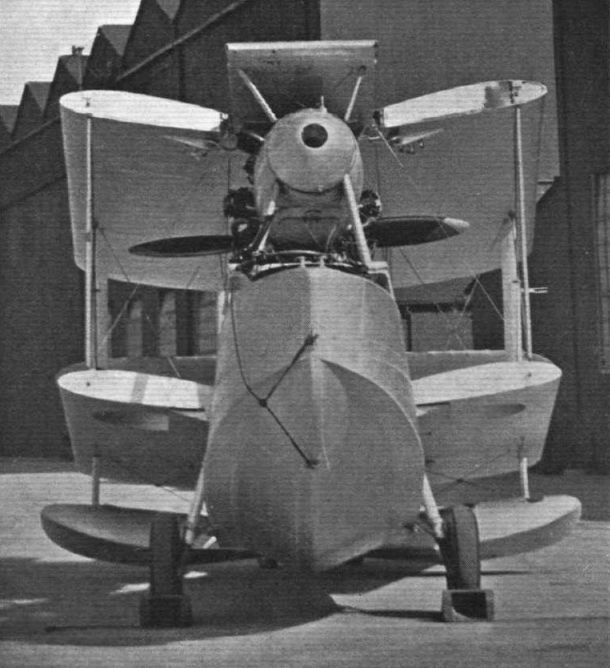 Except for the cockpit arrangements the single-seater is similar. 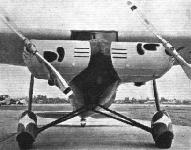 FOR HIGH-SPEED TRANSPORT: The Airplane Development Corporation V-1 three-quarter front view. A MODERN UNDERCARRIAGE: One-half of the retractable undercarriage. 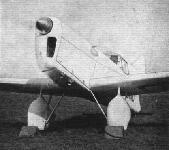 The tail wheel also is retractable. A "HAWK" FOR IRELAND: Phillips &. Powis have just delivered this "Hawk" to Lady Nelson, of Everson Flying Services, Finglas. With the machine are Mr. J. R. Currie, chief ground engineer of the company, and Capt. Hamilton, who learnt to fly at this school. 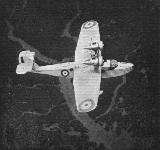 FOR SHORT-WAVE WIRELESS TESTS: Marconi Type A.D. 43A transmitter installed in a Bristol "Bulldog" single-seater fighter for recent short-wave tests between the Marconi experimental station at Croydon and the aeroplane in flight over the Bristol district. The corresponding receiver, Type A.D. 44A, is mounted at the back of the transmitter. This photograph shows the method of installation, the aerial system, and the Marconi-Stanley one-horse-power engine and flexible drive used for running up the generator on the ground for testing and adjusting purposes. 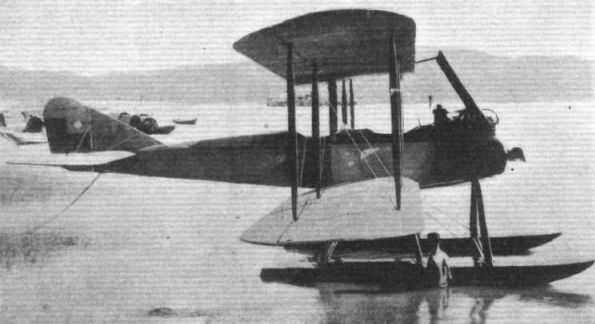 THE FARMAN 220 BOMBER: Three-quarter front view. 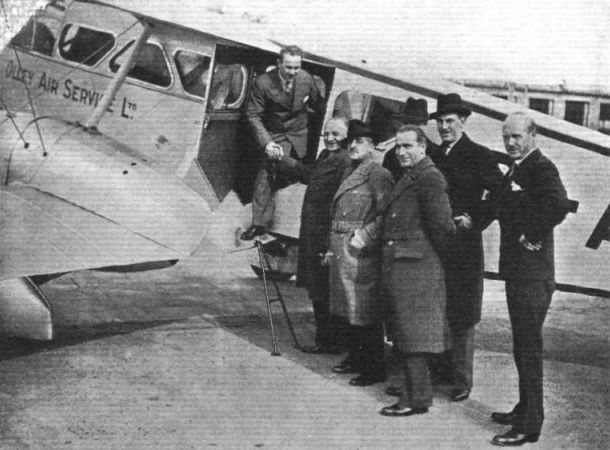 NATIONAL RECOGNITION: An air display, organised by the Aero Club of Spain, was given in Madrid recently in honour of Juan de la Cierva, and to celebrate the award to the latter of the F.A.I. 1933 Gold Medal. 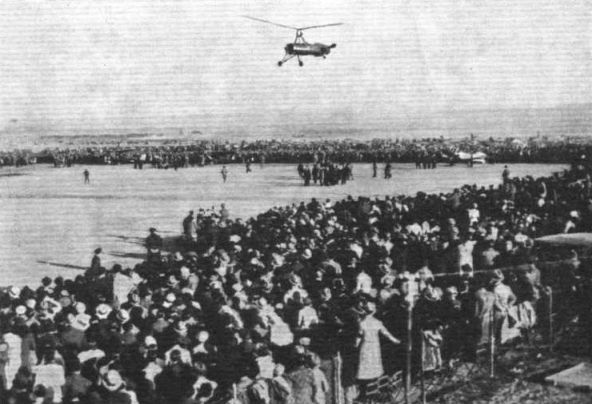 Here we see Senor de la Cierva giving a display, at the Barajas Military Aerodrome, in the C.30 type Autogiro. MILITARY LOAD: The Breguet 27 is not of new design, but during the past two or three years it has been continually improved. Here we see it in its latest form - fitted with a Gnome-Rhone "Mistral Major" 14 KRSd supercharged two-bank radial, which gives well over 1,000 h.p. for take off, and is rated at 815 h.p. at 2,390 r.p.m. at 7,150 ft. As a reconnaissance machine or as a bomber, the "27" is equally efficient. In the latter form, a bomb load of about 1,840 lb. may be carried. The performance figures for the Gnome-Rhone-engined version are not available for publication, but when the "27" is fitted with the Hispano-Suiza 12 Ybrs water-cooled engine of 850 h.p., it has a maximum speed of about 186 m.p.h., climbs to 16,375 ft. in about 9 minutes and has a ceiling of over 30,000 ft. - not, of course, carrying the maximum permissible bomb load. 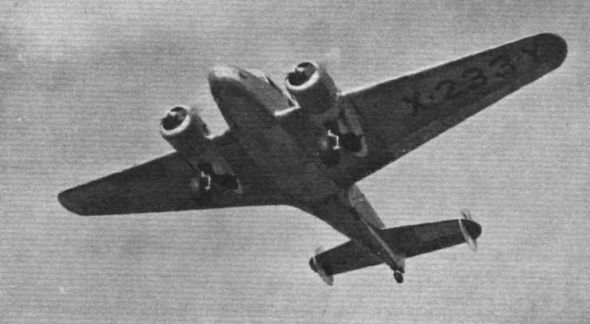 The Breguet 27 A2, fitted with a 500-h.p. Hispano-Suiza engine, is a standard type in the French Armee de l'Air. 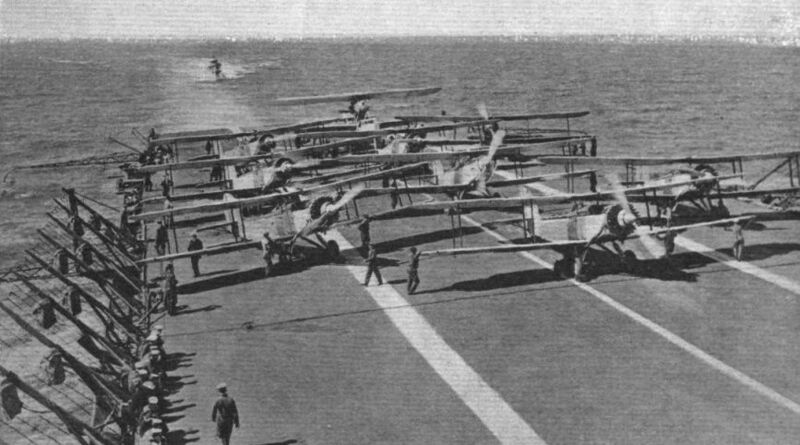 FAIREYS AT THE BOTTOM OF THE GARDEN: This photograph, taken on board the aircraft carrier Courageous during the Spring Cruise in the Mediterranean, is of interest not only on account of the large number of Fairey machines ranged on the flying deck, but also because at the back, over the extreme stern, may be seen the Supermarine "Seagull Mark V" with Bristol "Pegasus" engine. The presence of the latest type of amphibian flying boat on board the carrier may be significant. 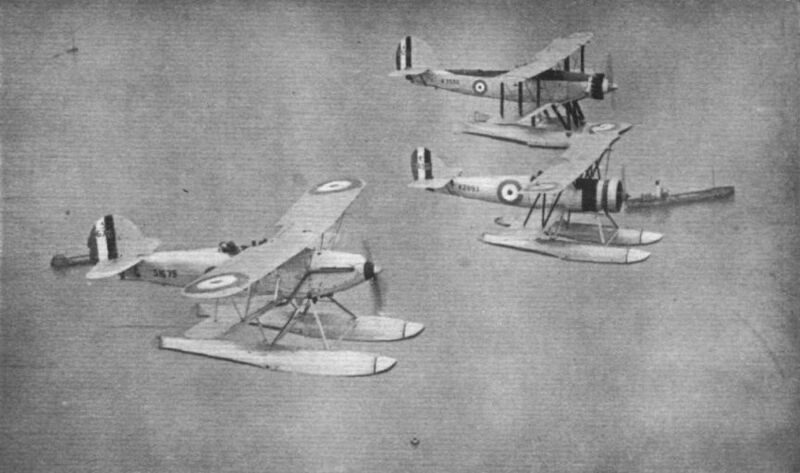 A FLIGHT OF THE SEAPLANE TRAINING SQUADRON: "Osprey" and "Seal" led by "Tutor." 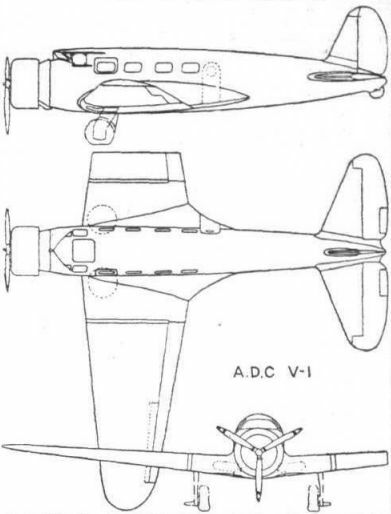 THE "SEAGULL V": This side view gives a good idea of the general lines of the machine. The view from the pilot's cabin is particularly good. CLEAN FRONTS: These two views of the "Seagull V" on the sea and on land show the care taken to reduce drag. 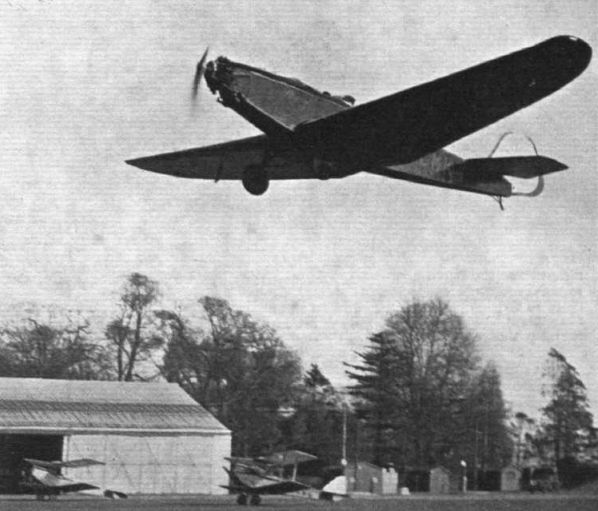 GOING - GOING - GONE: The "Seagull V" catapulted at Farnborough. The first picture shows the machine being drawn up the slope to the catapult. Then comes a picture showing the claws which secure the machine. 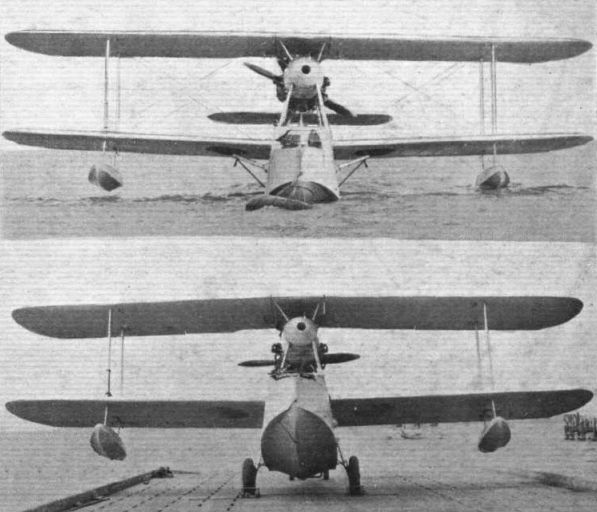 GOING - GOING - GONE: In the next all is in readiness for launching by the catapult, and finally the "Seagull V" is seen just as it leaves the catapult, piloted by Fit. Lt. S. R. Ubee. 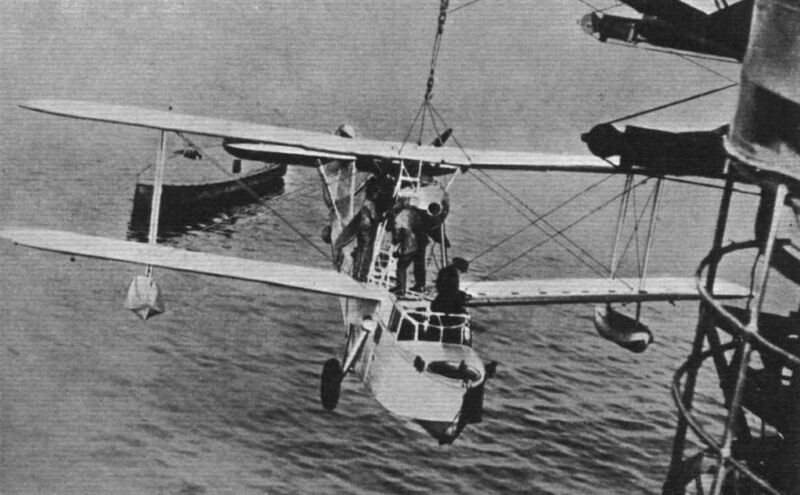 IN THE MEDITERRANEAN: The Supermarine "Seagull V" being hoisted on board the aircraft carrier Courageous. 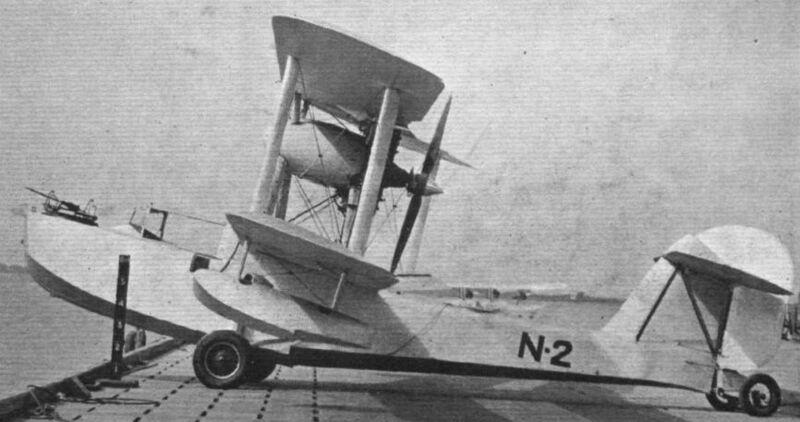 FOR STOWAGE: The "Seagull V" with wings folded. Note the small folded width. 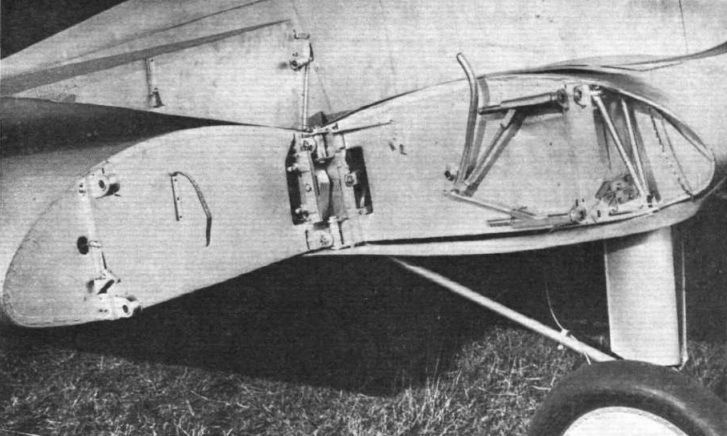 THE AMPHIBIAN GEAR: Note that when in the raised position the wheel is completely housed in a recess in the wing. Был построен только один DC-1, и фирма "Douglas" потеряла 306 778 долларов собственных средств на создание и испытания этого самолета. Тем не менее, он расчистил путь для самолетов мирового класса DC-2 и DC-3. 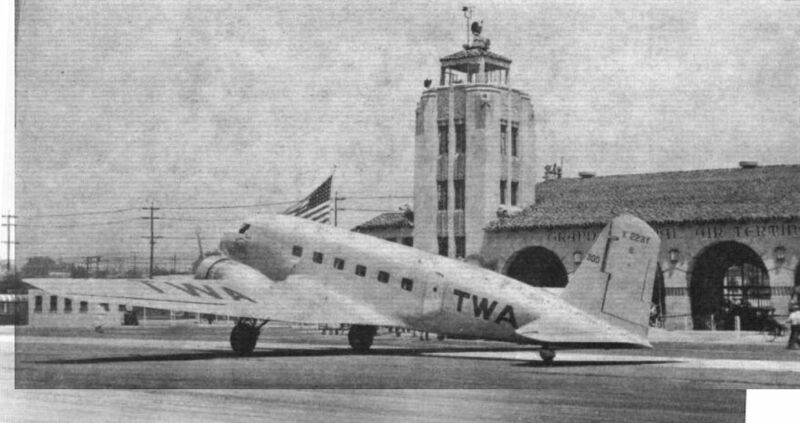 A Douglas D.C.1 "Transport" as supplied to Transcontinental & Western Air, Inc. WAITING TO GO: Seven "Tiger Moths" and one "Dragon" at Hatfield, ready to start for Copenhagen. The Danish crews include Capt. C. C. Larsen, Lts. Clausen, Meincke and Rydman, Sgts. Eriksen, Petersen and Hansen, and Machine Officer Petersen. 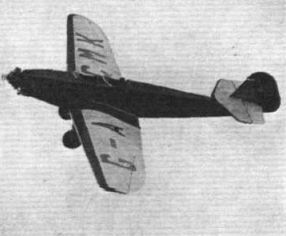 FAST TOURING: A glimpse of the "Mew Gull" flying past, with its designer at the controls. 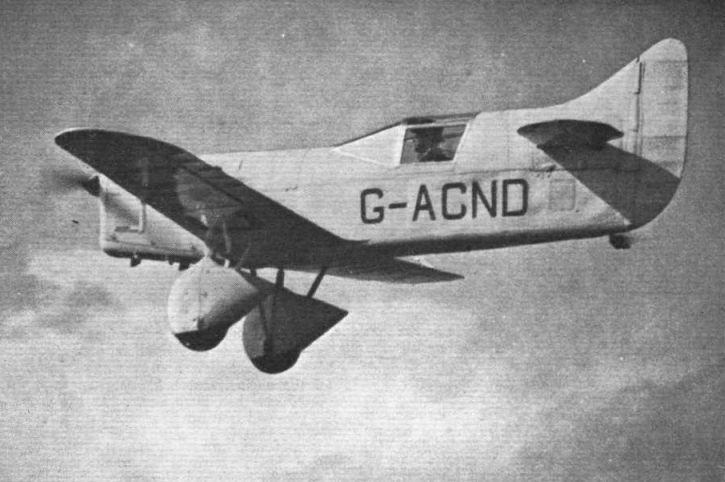 The prototype Mew Gull, G-ACND, was originally powered by a Napier Javelin but later reengined with a 200 h.p. Gipsy Six. This view of the machine indicate that in spite of the location of the cabin, the view diagonally forward is quite good. 200 M.P.H. 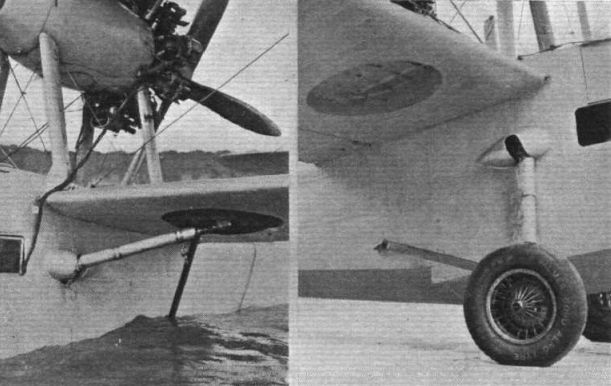 : Mr. E. W. Percival demonstrated his latest machine, the "Mew Gull" (Napier "Javelin"), in a gale last week. ROOM ENOUGH: In spite of the small size of the machine, there is room in the cabin for a large pilot (in this case Mr. Percival himself) wearing his parachute. The luggage locker is in the tail fairing. 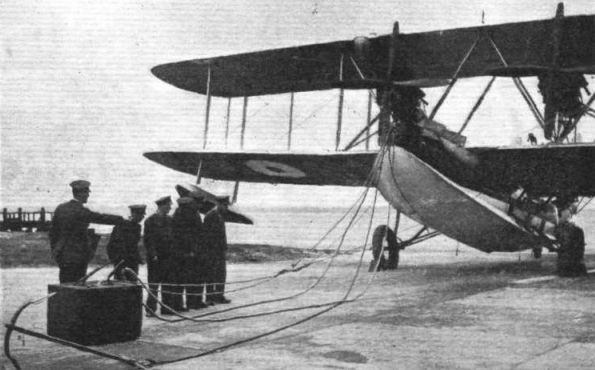 PREPARING FOR THE FIRST FLIGHT: Mr. Percival may be seen on the right, donning his parachute before taking the "Mew Gull" up in a gale. IN FULL FLIGHT: The Lockheed "Electra" makes its maiden flight at Burbank, California, on February 23. FOR TRANSATLANTIC SERVICE? 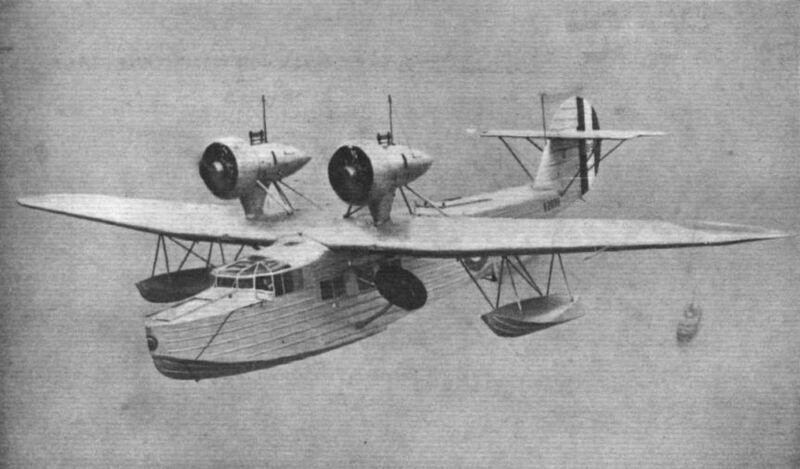 : The Sikorsky S.42 four-engined flying boat recently completed for Pan-American Airways. After tests it will be put into service between the United States and South America, and subsequently may be used for transatlantic service. THE GOLD SEEKERS: The two D.H "Dragons," Golden West and Gay Prospector, employed for Surveying gold-mining areas in Western Australia. A BUSINESS TRIP: Officials of Pass & Joyce, distributors of Talbot cars in London and Home Counties, recently made a tour of inspection of their area in a "Dragon" belonging to Olley Air Services, and are shown here in our picture. The group includes Capt. Olley, who is standing in the doorway of the 'plane, and shaking hands with Mr. A. H. Pass. Next to Mr. Pass are his co-directors, Mr. C. J. Joyce and Mr. S. H. Devey, while Capt. C. R. F. English, the manager of Pass & Joyce, is next in line, slightly behind Mr. Devey. 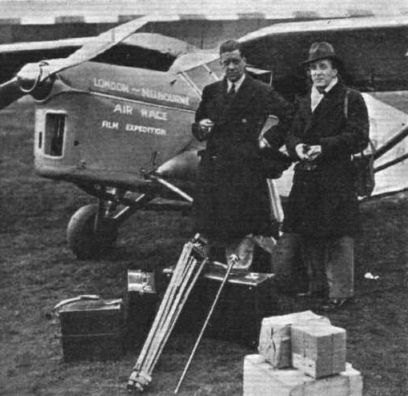 FILMING THE ENGLAND-AUSTRALIA AIR ROUTE: Mr. Roy Tuckett (left) and Mr. John Chapman (photographer), who are flying out to Koepang for the purpose of filming sections of the England-Australia air route. 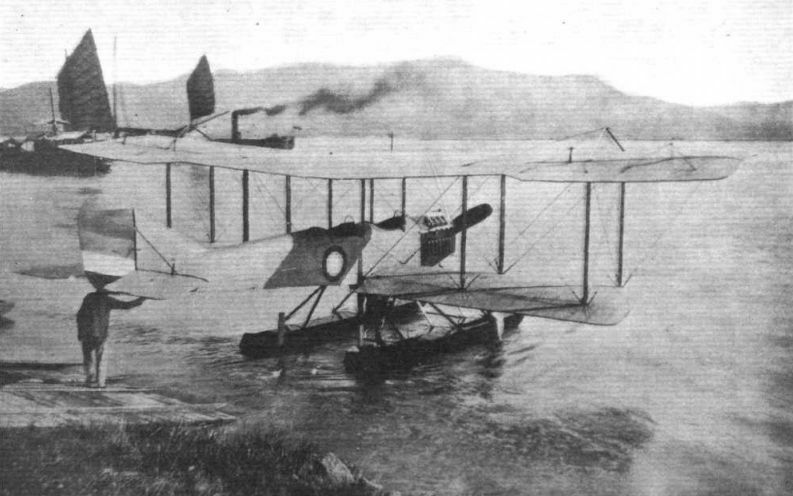 Their "Puss Moth" has been specially equipped with aerial film cameras, and the Vacuum Oil Co. have made all arrangements en route for fuel and oil supplies..
ON THE SLIPWAY: An "Osprey" is about to be beached, and airmen are arranging the trolleys under the floats. 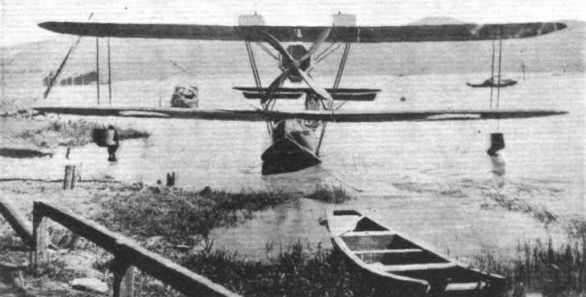 THE "CHAR": A two-seater open cockpit primary training seaplane. 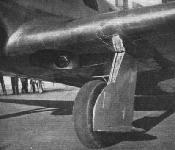 It is fitted with a 100-h.p. Curtiss water-cooled V engine. THE "YEE": This is a two-seater open cockpit advanced training seaplane, fitted with a 100-h.p. Hall-Scott water-cooled engine. The executive staff of the Naval Air Establishment at Lungwha, Shanghai. Left to right: Capt. Tseng Yee-king, B.Sc. (present Director-General); Capt. Barr Yu-tsao, M.Sc; and Capt. Wong Tsoo, M.Sc, A.F.R.Ae.S. 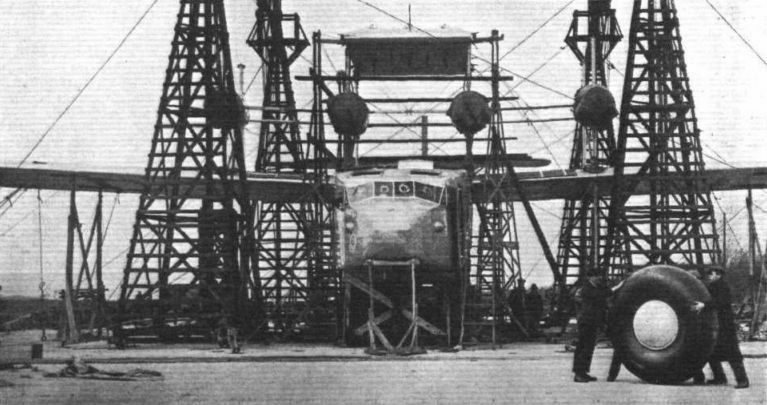 A FLOATING HANGAR: Designed by Capts. 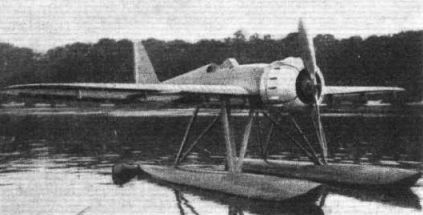 Barr and Wong, this is of steel construction and is partly submersible so that the seaplane can be taxied in or out of its hangar. 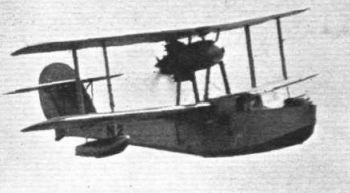 THE "DING": A bomber or passenger seaplane. It has two open cockpits and a cabin with accommodation for four. The engine is a 360-h.p. Rolls-Royce. THE "BEENG": A single-engined (360-h.p. 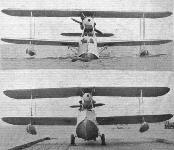 Rolls-Royce) biplane flying boat, military bombing or commercial. 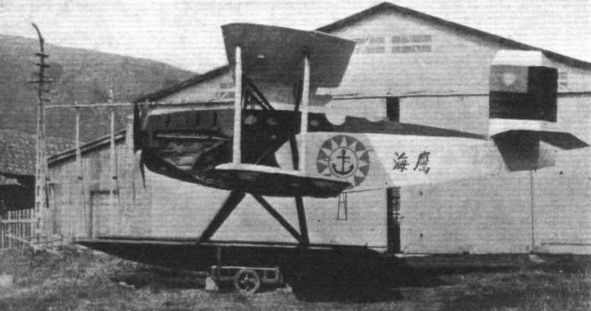 It has three open cockpits and a cabin seating four. 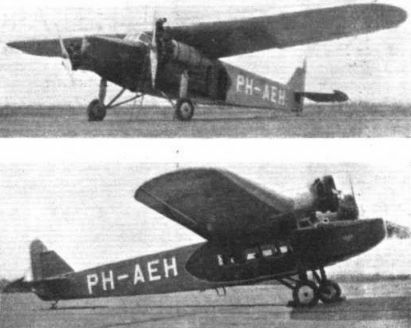 UNUSUAL MARKINGS: An Armstrong-Whitworth "Atlas II" ("Panther IIa") supplied to China. 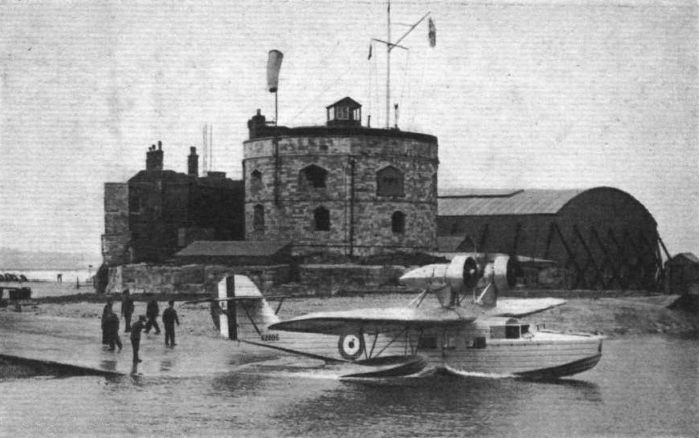 On the port top plane is the squadron marking. The national marking is carried on the starboard wing. A SUITABLE SIGN: Used as "a memorial to past achievement and an inspiration to further endeavour," the original "Tiger Moth" and holder of world records, is now to be seen attracting people to the site of the new D.H. factory at Hatfield. В открытых кабинах самолета P-16, расположенных тандемом, размещались летчик и наблюдатель-стрелок. 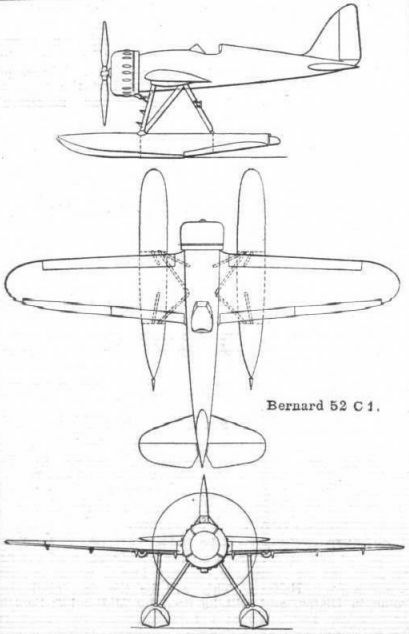 THE BERNARD 52 C I before proceeding to St. Raphael for official tests. 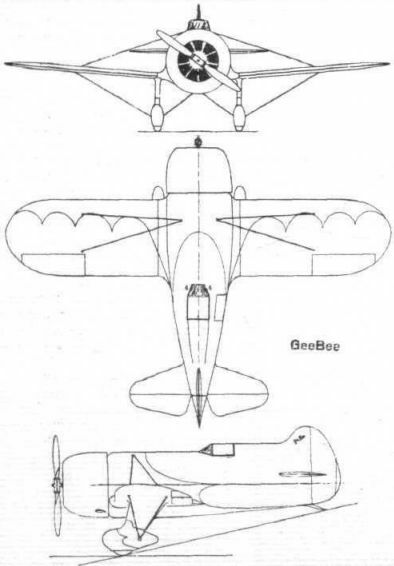 THE GEEBEE "INTERNATIONAL SUPERSPORTSTER": An American design for the England-Australia race. FROM PERU: A Panair (Pan-American Airways) Consolidated "Commodore" arrives at Para from New York. This photo was taken by Miss Winifred Brown during her visit to S. America and Upper Amazon - on which subject she is now giving a series of lectures. IMITATION THE SINCEREST FORM OF FLATTERY: This machine, known as the "Chidorigo," was constructed by the Tokio Gas & Electric Industry Co., and is remarkably like a D.H. "Fox Moth" - although the company is in no way associated with the de Havilland Co. It is fitted with a 7-cyl. 150 h.p. Gasden "Zimpu" (which, again, closely resembles the Armstrong-Siddeley "Mongoose"). It is being used by the Japan Aerial Transport Co. for taxi and joy-riding purposes. A brief specification of this machine is as follows :- Span, 9 ft. 2 in. ; wing area, 236.7 sq. ft.; weight empty, 1,212.75 lb. ; laden weight, 2,116.8 lb. ; speed range, 46-122 m.p.h. ; range, 404 miles. 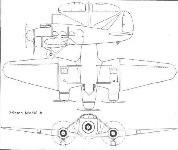 THE FOKKER D.XVII: This drawing shows the machine fitted with a Curtiss "Conqueror" engine. 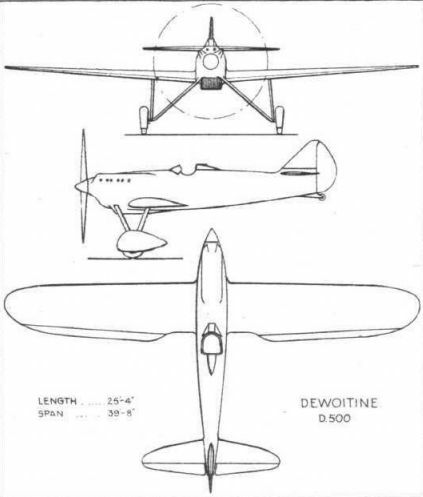 Later versions have the "Kestrel," Hispano-Suiza 12 Xbrs or Lorraine "Petrel." THE SAME THING, ONLY DIFFERENT: On the top is a Fokker F.VIII (2 Bristol "Jupiters") in its original form. 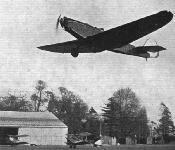 Below it is seen equipped with two Wright "Cyclone" F/R1826 engines, mounted in the leading edge of the wings. 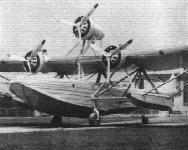 THE MARTIN 121 flying boat as fitted with three engines. The Martin 121 flying boat as a twin-engined machine. ON THE SLIPWAY: Airmen are receiving instruction in mooring tackle. 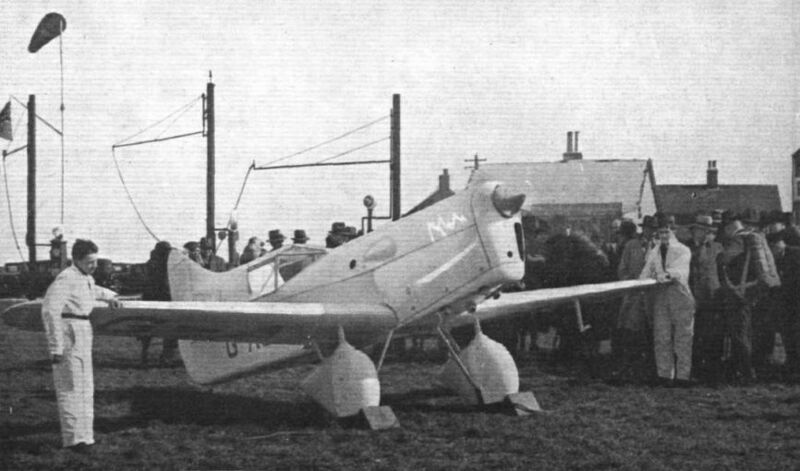 A GUERNSEY GLIDER: The "Scud I" which is used by the Guernsey Gliding Club at St. Peter Port. The club propose to build a similar machine. WHERE IS THE MOAT? 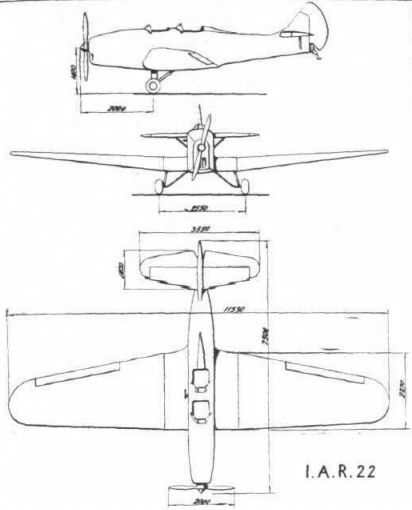 Here we see the latest development of the type A.B.21 bomber manufactured by the Societe Aerienne Bordelaise. The machine, which has a span of over 120 ft., is fitted with four Lorraine "Petrel" engines. 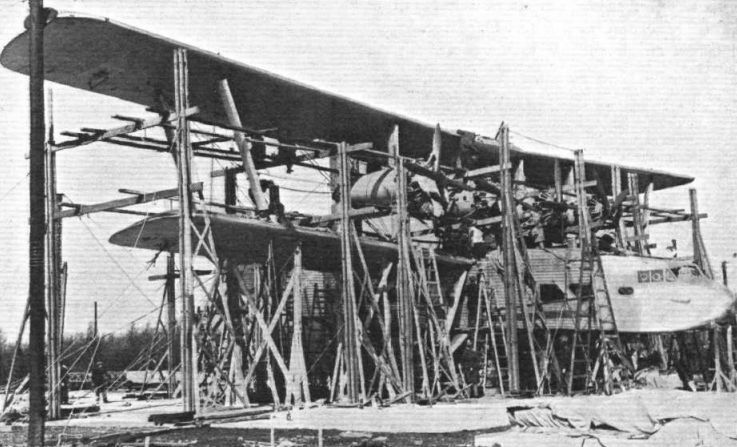 OUT IN THE OPEN: Erecting the Short "Scylla" at the new aerodrome, Rochester, where no hangars have yet been built. The work of building the hangar and erecting the machine are proceeding simultaneously. The men holding the Dunlop wheel give an idea of the size of the "Scylla," which is the first of a batch of machines being built for Imperial Airways, Ltd. TAKING SHAPE: The Short "Scylla" (four Bristol "Jupiters") being erected in the open at the Rochester aerodrome. The boisterous weather during the last week or two has interfered greatly with the work, but it is expected that the machine will make its first flight this week. FROM ROUMANIA: This interesting machine, or "avionette," has been designed and constructed by D. Mihail, of Bucharest. Named the "Stabiloplan IV," it is fitted with an A.B.C. "Scorpion Mark II" engine, and a successful private test has already been accomplished. Official tests are to be made later. 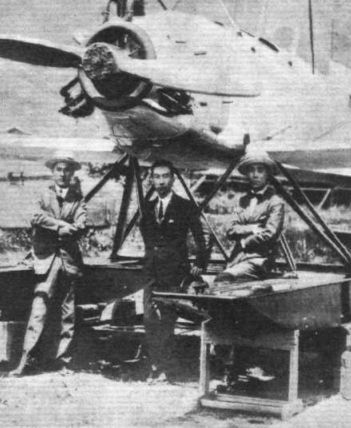 A JAPANESE LIGHT PLANE: The Itoh high-wing 2-seater monoplane, constructed by the Itoh Aeroplane Factory of Chiba, near Tokio, and equipped with a 40 h.p. 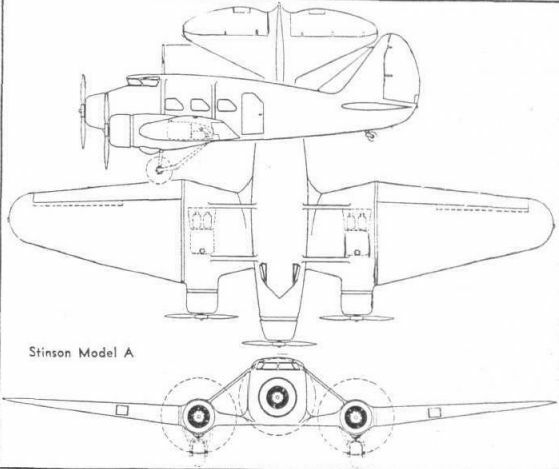 British Salmson engine. 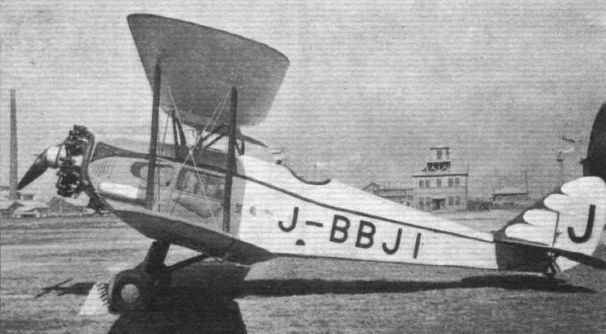 It is used by the Japan Light 'Plane Club, an unsubsidised concern organised by a pioneer of Japanese aviation, Baron Narebara.